Let’s pop all these ingredients in our “brain-compatible classroom activity generator” and let it help us get practical. We want to combine the science behind emotions, physical movement and socialization. Presto! It just so happens that one of the brain-based learning strategies I use is the engagement of rituals. Here are the five ingredients of a quality classroom ritual. If you do anything less than ALL five, it will dramatically degrade your results. The ritual must solve a recurring problem. It must include and engage everyone. The ritual must be simple and easy to do. It must be highly predictable and the students know when it’s going to happen. The actual event must end up in a positive emotional state. The use of rituals can make your life easier. If rituals don’t actually solve a problem, kids will lose interest, because there’s no point in doing them. Let’s use, as an example, the problem of starting class, on time, with a good attitude, every single day, for weeks and months on end. That means you need a ritual, so let’s create one and then we’ll break it down. Problem to solve: You need to start class. When it’s used: Use when students arrive at school from home, or back from recess or lunch. What the students do: They raise their hand and say, “Yes!” Then they turn to the person nearest himself or herself and say “Happy Monday to you!” (or “Welcome back”.) This silly little process solved a critical problem: to get students quiet, to remind them of the social conditions and get into a positive state. It took 4 seconds and cost you nothing. I use 10-15 rituals in the “Teaching with the Brain in Mind” 6-Day workshop. 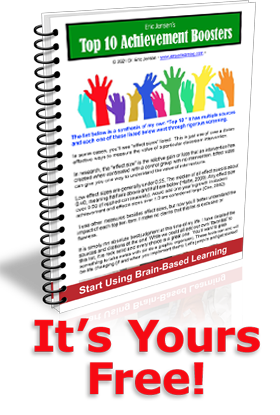 This is the best place for you to learn about brain-based learning rituals and other strategies, because you get to experience them live! The best book on rituals is Super Teaching (2008), available from Corwin Press. This process of integrating brain-based learning rituals into your school (macro) and the classroom (micro) reminds us to cut to the chase: everything you do in your classroom is likely to have SOME effect on the brain.